Includes C,F,G,G7,Am,Dm, and Em chords, and provides an excellent introduction to the chord playing method. Your beginning bell ringers will easily be able to match their bell to the pictures on these cards, allowing them to create instant chord accompaniments. This set can be used successfully with many of the songs included in RB7014 8 Note Bell Songs and RB7015 More 8 Note Bell Songs books and some of the songs in the SP2395 "Primary Bells" book. All of the songs in the SP2397 "Easy Hymns" book can also be played using this set. 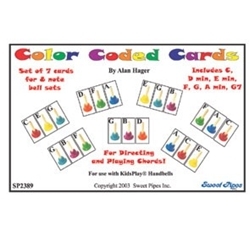 These chord cards are color coded to be compatible with the Kidsplay RB108 Handbells, RB109 Deskbells and RB107 Combinedd bells. We also highly recommend purchasing the card holder!